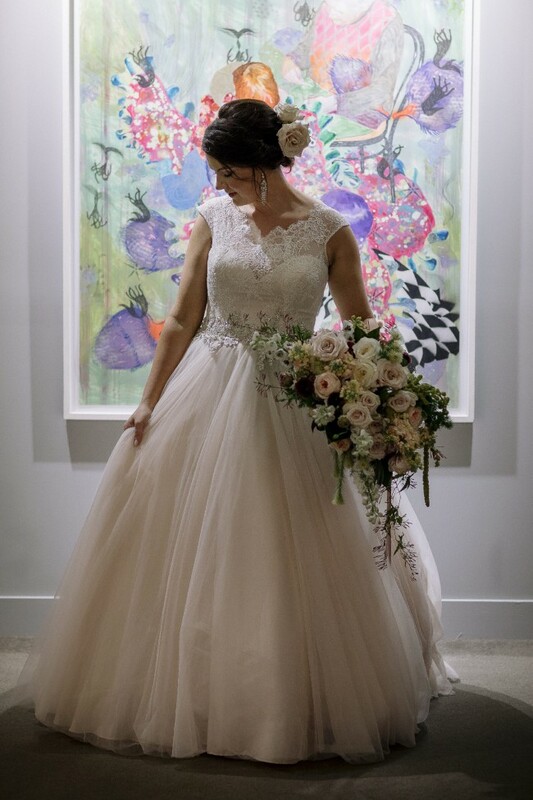 I absolutely fell in love with this beautiful dress and adored wearing on my wedding day, but I have no use for it now and it would make me so happy to see someone else enjoy it as much as I did. The gown is champagne in colour - a beautiful taupe in some lights and blush in others. I have a size DD bust, and usually would absolutely need to wear a bra, however the support in the bodice is exceptional and I didn't need anything else on the day. I purchased this dress in 2017 at size 18W - and after losing some weight I had alterations to suit a street size 14(AU). As I am 180cm tall, no length has been taken from the bottom. The dress has been professionally dry cleaned and is boxed with tissue paper, however due to there being multiple layers of English netting there are some small amounts of lint caught in between. It would not take a lot of effort to remove these. Description from Allure Bridal: "Romantic and classic. This ball gown combines lace and English Net perfectly. The lace bodice features a scoop neckline with cap sleeves while crystals accent the waistline." Once you send a message, Leesa can invite you to purchase the dress.